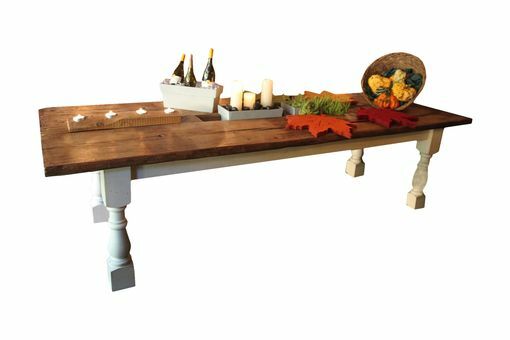 This Stunning Farm House Style Table Makes a Statement! The Trashing Board Top was reclaimed from a Barn in Ohio 1800s. We have created a cut out that holds 3 zinc Storage Bins in the center for Wine, Beer, Water, Candles, and Holiday decorations. The chunky Farm House Legs & Apron can be painted and waxed in any Annie Sloan Chalk Paint® Color you like. Love it but need something a little different? Design your perfect one-of-a-kind with us.